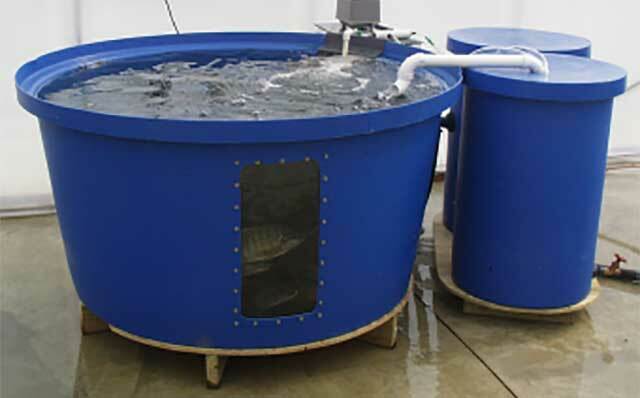 Fish: The Aquaponic System has been successfully used for growing food fish, ornamentals and bait fish. A table is appended to the end of this Manual to give you an idea of the water quality tolerances of various fish species. When planning this part, pay closest attention to the temperature needs of the fish and make sure the Aquaponic System will be operated within the necessary range. For the plants’ sake, it will be good to aim for stocking enough in the tank to eventually reach a minimum of 25 lbs of fish. We recommend starting off with a hardy and robust fish such as tilapia. The many kinds of tilapia are generally quite tolerant of a wide range of environmental conditions and they taste great too! Our Aquaculture Department can recommend many reputable sources of tilapia fry—just give us a call. If you want to operate with warmer water, Nile (0reochromis niloticus) and Mozambique (0. mossambicus) would be good choices and will grow fastest in their optimum temperature range of about 85oF; Blue tilapia (0. aurea) will fare better in cooler waters down to 60-70oF on a daily basis. Stocking mortality can be reduced by making the fish’s introduction to their new environment as gentle as possible. If they arrive in a plastic bag (usually inflated with oxygen), float the bag in the tank for 15 to 20 minutes to get the temperature inside the bag evened out with the tank. Open the bag and scoop some water from the tank into the bag. Wait a few minutes and introduce some more tank water. After a few more minutes, the fish will probably be anxious to get out: tip the bag and let the fish swim out into their new home. Wait at least a few hours before trying to feed them—many fish are anaesthetized for shipment and won’t have much of an appetite right away. When they are ready, try to feed at the same times each day, and only give what they’ll readily eat in a 15-minute period. We recommend having a broad range of sizes of fish in your Tank so that when you harvest only the largest, your plants won’t lose their source of nutrition. A healthy system can have 80 pounds or more of fish in it that you can continually harvest. Mortality is a natural part of life—animals can die for sometimes no apparent reason at all at any stage of the life cycle. When this happens, remove the body so that it won’t decompose and become a source of disease, poor water quality and/or raise the ammonia level too high. (If the ammonia suddenly spikes, say over a one or two-day period, look for a body!) Don’t worry if mortality seems high, particularly right after stocking —commercial growers often expect 20% or more of the fingerlings they stock to die before harvest. Feeding: Fish that are being fed on a daily basis, at least 2-3 times a day, will grow well for you. Feed no more than what they can consume in a 15-minute period. Floating feeds are best for recirculation systems because they allow you to observe how much is being consumed and none is lost through the drain right away. Try not to increase the amount being fed by more than 10% on a daily basis so as not to overload the filtration capacity of the system. Tilapia are typically given feeds with protein that ranges from 25% to 35%. Perch and other carnivorous fish need a diet with higher protein levels. Pellet size should be matched to mouth size, since a small fish can’t take in large nuggets of feed. Starting 1-2” fry on a #2 or #3 crumble is common. A bag of larger size feed can be purchased and the pellets crushed for the small fish in a blender, with a mortar and pestle or even between two bricks, although the very fine powder should be sifted out prior to giving it to the fish. As the fish grow, pellet size is increased and protein levels can come down somewhat. Many commercial fish feeds have a shelf life of three-or four months. Ask the vendor how long it can be kept. Storage should be done in an opaque, airtight container and put in a cool place away from insects and rodents. Plants: An amazing variety of plant crops can be grown with your Aquaponic System, including salad greens, herbs, flowers and fruiting vines. Be sure to explore to its fullest potential! We recommend starting with leafy greens like lettuces and herbs. Bibb, romaine and leaf lettuces do particularly well, as does watercress, basil, chives, mint and many other herbs. Planting on a staggered basis will provide continuous harvesting and ensure that there will always be plants in the system to take up the nutrients generated by the fish. For example, if your crop takes four weeks to grow and you divide your Tray in fourths, you’d germinate some seeds each week. Have fun experimenting with different planting patterns, different crops and mixing the plants that you put in! To maximize the use of your growing space, keep your seedlings in their sprouting tray as long as possible before introducing them to the Aquaponic Tray. For example, it is common to leave lettuce seedlings in their sprouting tray for about 3 weeks, or until they grow four true leaves. Then transplant them to the Tray and let them grow there for another four weeks or so until harvest. If you use an inert media to germinate the seeds, e.g., the rockwool cubes in our Seedling Starter Kit, it’s important to water with a half strength fertilizer solution (“Miracle-Gro,” etc.) one to two times a week after they sprout and until the seedling is placed into the Aquaponic Tray. This will ensure adequate nutrition. Make sure the media never dries out either. When you plant the seedlings, make sure that most of the seedling starter cube (or other germination media) is pushed down into the Aquaponic Tray growing media. Plants that wilt or dry out may not be getting adequate access to the aquaponic water: ensure that the seedlings’ cubes remain damp after transplanting by checking them and pushing farther down into the media, if necessary. Replace plants as they are harvested or as necessary to keep the bounty of your Aquaponic System flowing. Be sure that tall or vining plants will have adequate support for stems and fruit. Nutrients other than nitrogen: You may recognize nitrate as a key component in commercial plant fertilizers. The plants use the nitrogen produced by the fish for growth—it’s especially good for green foliage. Higher protein content in the fish feed usually relates to higher nitrogen content in the water. Depending on the fish feed, the plants will also have other nutrients available for growing, including some potassium, phosphorous and trace elements. If you note unusual growth patterns in the plant stems, leaves or fruit, there may be a nutrient deficiency. For example, lettuce often needs a little more iron than what comes in many fish feeds. Pale yellow spotting (“chlorosis”) in lettuce leaves can occur when iron is too low. In this case, the addition of a little chelated iron may be called for. “Hydroponic Food Production,” by Dr. Howard Resh, is an outstanding resource for diagnosing nutrient deficiencies, among other things. (This reference is available from us.) There is also plant tissue and water analysis available; routinely facilitates this service for our commercial hydroponic growers and we would be happy to assist you with this should you decide a lab analysis would be helpful to you. We also carry a full line of micronutrients, such as chelated iron, at very reasonable prices to help ensure the success of your efforts. If plants show signs of slowed growth, lighter than normal leaf color, and the nutrient levels are fine, it may be that adequate light is lacking. Installing full spectrum fluorescent lamps or metal halide sun lamps can correct this; these items are available.